Deciding to live abroad is exciting but can also be stressful. One of the common struggles when first settling in a new place is managing your money. I have lived abroad in three different countries for over three years and over these years I have learnt a lot about managing money in a foreign country. In the early days, I made mistakes (such as just using my UK card overseas without a care in the world). Looking back I just wasn’t informed of what was the best thing to do. There were certainly times when I buried my head in the sand. You don’t have to do this. These 8 tips will help you to manage your money when making that big move to a new and exciting country. This needs to be the first thing that anybody does. Having a solid budget is the fundamental first step in managing your money. There are plenty of options when deciding on how to keep a budget. One of the most popular apps to use is You Need a Budget. This app is a good place to start but personally, I don’t want to pay to be able to track my own money. That is why I created my own budget tracker using Google Sheets. Using the excel/sheets format is extremely flexible. I have used this for about 4 years now and have tweaked it along the way to suit my needs. The great thing about using Google Sheets is that there is no need to download it to a physical drive. My spreadsheet is held on the Google Drive which means I can edit it on my phone or laptop and it the changes will be applied to the same copy. As I have moved from Germany, Cyprus, Egypt and the UK, I have had to track the different currencies that I am spending. Even when living overseas, I convert my spending into the currency I get paid in (GBP). The spreadsheet I use does all of this automatically. As I currently live in Cyprus, I have it set for Euros but it can easily be changed. If you would like unlimited and free access the budget tracker I have created, sign up to my mailing list at this link and you will receive a link to the spreadsheet. Or another option is to get a blank notebook and track your finances there. As long as you are keeping a budget, you are on the right track. If you are going to be earning money in the local currency, I would highly recommend that you get a local bank account. Using a foreign card at an ATM will often trigger charges but a local card won’t. There are a few reasons I choose to do this. I personally get paid in GBP into my UK account so it makes sense to keep it. I also want to maintain my high credit rating in the UK and having a UK account helps to do this. If you have no financial link to your home country, getting a mortgage or a loan in the future can become more difficult. I use a parents house as my permanent address but it doesn’t really matter where you use. As long as you have permission from the homeowner. I do this to maintain my name on the electoral roll in the UK to improve my credit rating. You will be considered more of a financial ‘risk’ if you have lived abroad for a number of years. It’s just the way it is. This is one way of getting around that. I frequently transfer money from my Cyprus account to my UK account. Doing this through the bank’s official service costs a fortune so I use the app TransferWise. This cuts the cost of foreign transfers by a huge amount. You can also use Revolut which offer a similar service. Currency rates constantly change. Knowing what your local currency is actually worth sounds like common sense but it is one of the easiest ways to get conned when you first arrive in a new country. I use the XE app frequently when I first arrive in a country until I understand what the local currency is worth. When it comes to tax, the last thing you should do is stick your head in the sand. Understanding what you are obliged to pay in the country is super important. Not paying the correct tax will land you in serious trouble. It’s not all bad news when it comes to tax. In many countries, foreigners are exempt from paying tax or only pay a small amount. If you are British some of these countries include the UAE, Qatar, Georgia and Thailand. You may have moved abroad indefinitely or have a date where you plan to return to your home country eventually. Either way, planning for the future should not be ignored. 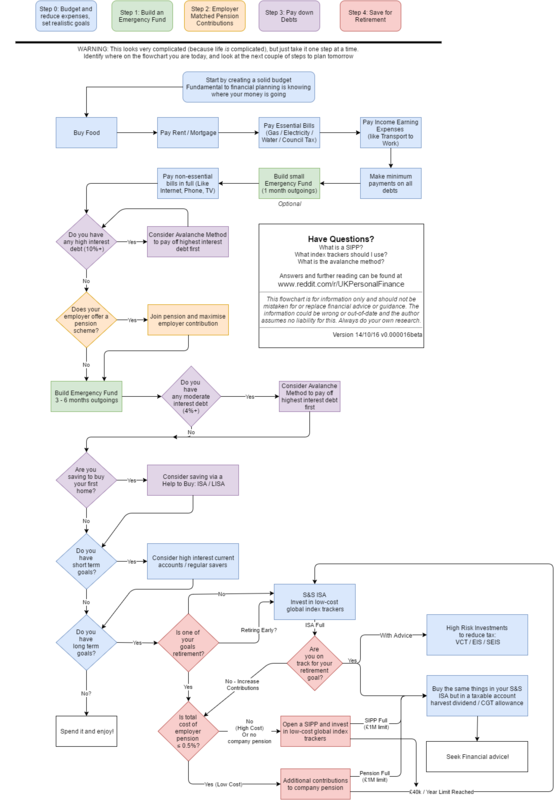 The flowchart below is taken from the Reddit UK personal finance page and should be the starting point for anybody wanting to be more financially savvy. Start at the top left and work out where you sit on the flowchart. This is aimed at British citizens but can be applied to most people in the world.